Since its beginnings in 2007 the Center for Adaptive Riding has been providing fun and safe equine assisted activities to individuals of all abilities. All of our instructors have passed stringent PATH International testing to become certified, and continue their education annually. 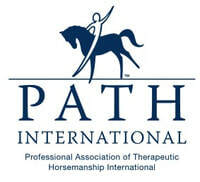 We also are certified to offer mentoring for PATH Instructors in Training. Every individual is unique. Using the long-term goals of each rider, lesson plans are created for each lesson using developmental steps to attain those goals. Whether a rider wants to improve their core strength, balance, communication, or flexibility, our professionally certified instructors are here to support those goals! Horsemanship is more than sitting astride a horse. Care of our horses is an integral part of what we offer. The results are a partnership between our horses and riders that encourages independence, caring for others, and understanding of a horse’s own uniqueness. These attributes generalize out into the community at large. If you are interested in our program, we would love to speak with you. Please call or email us to schedule a visit to our facility.